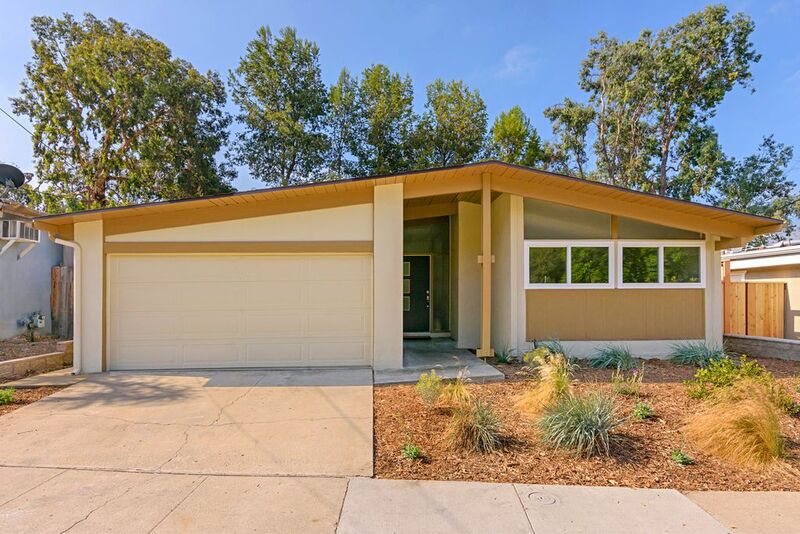 Built in 1960 by the Drogin Construction Company is this Palmer & Krisel-designed home in San Diego’s College Glen Estates neighborhood. 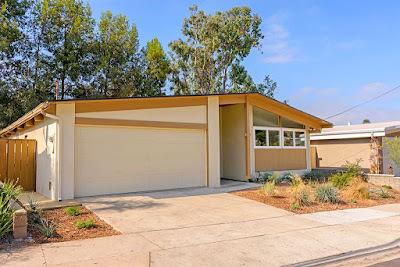 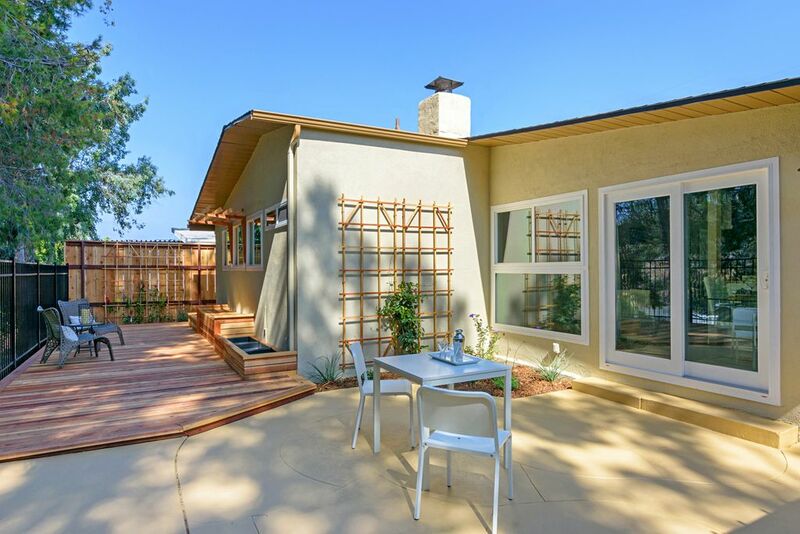 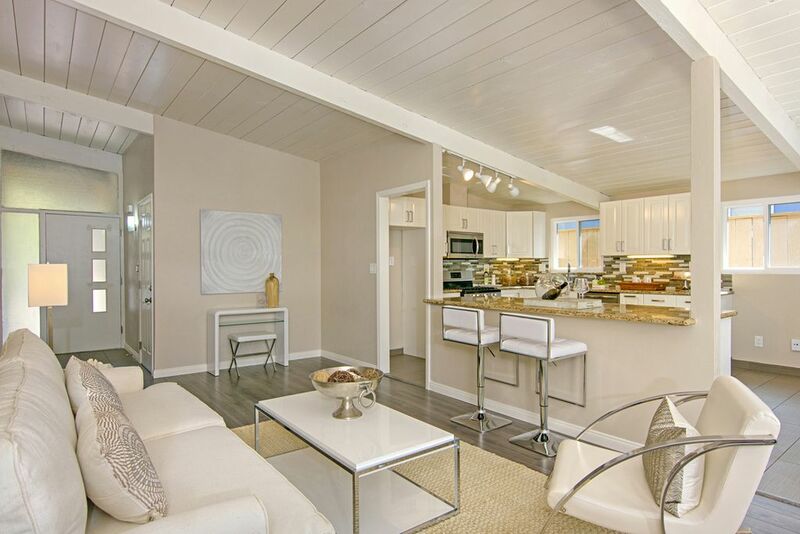 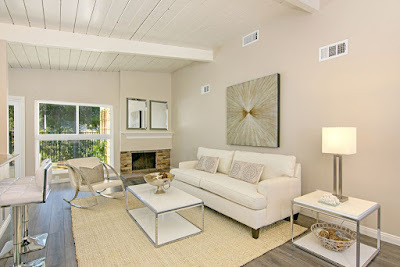 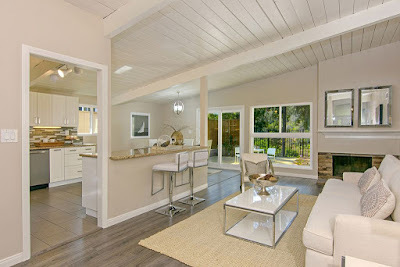 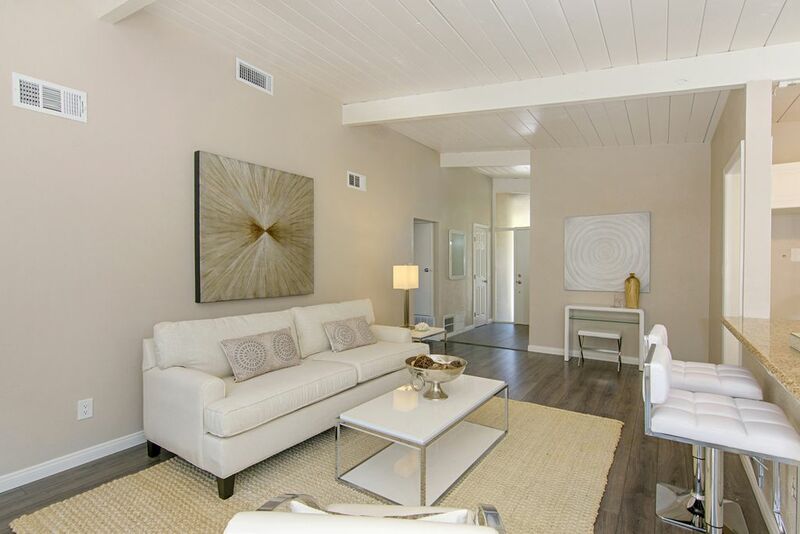 This midcentury home has seen lots of new changes to the interior, and features four bedrooms and two bathrooms in 1,492 square feet, sits on a 9,200 square-foot lot and carries an asking price of $569,900. 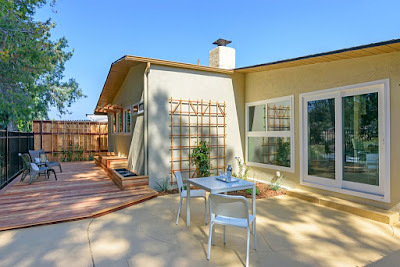 Like many of the College Glen Estates homes, this north-facing house sits close to the street, with a shallow front yard planted with random drought-tolerant plantings. The replacement white vinyl windows stick out like a sore thumb on this home, but the new midmod-inspired front door makes up for the chunky replacement windows. 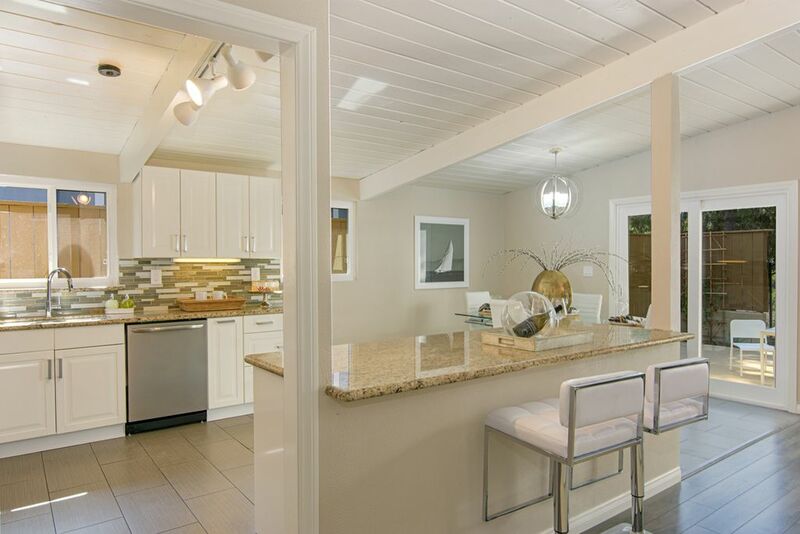 Inside, the home has seen newer trends imposed upon it, but luckily has seen the open beamed wooden ceiling has been left intact. Most of the demising wall between the kitchen and living room has been removed, allowing living room guests a full view of the kitchen, however for some reason the original doorway was left intact, drawing even more attention to the fact that a wall was removed. Krisel’s signature modernist fireplace has been given a very traditional and unremarkable makeover, with stone veneer and ornate mantle. 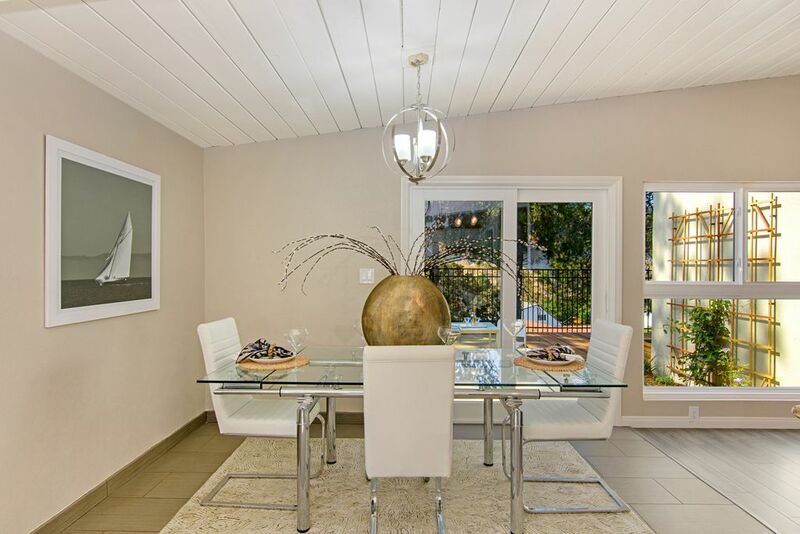 The dining room sits at the rear corner of the home, overlooking the backyard deck area, and sits adjacent to the kitchen area. 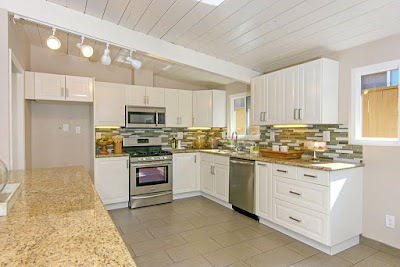 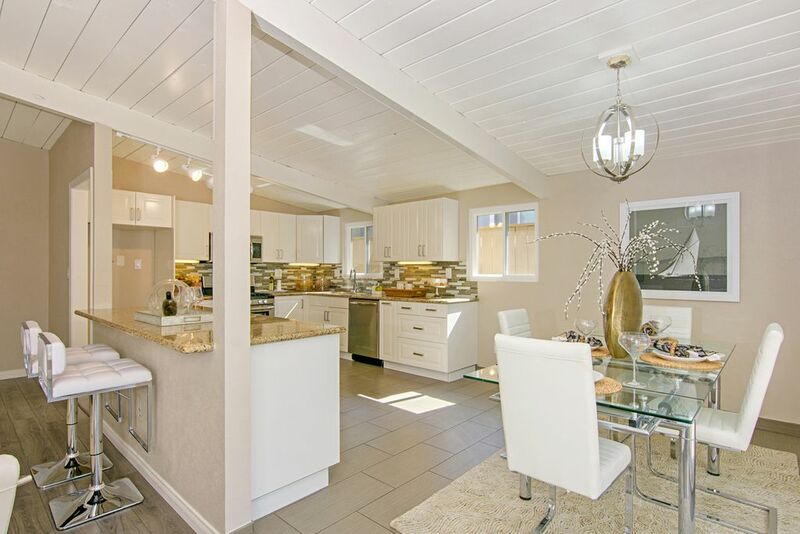 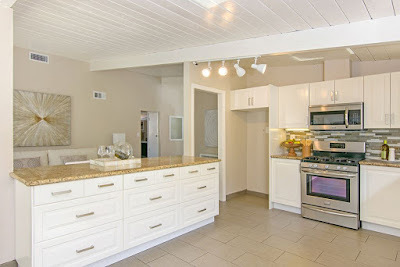 The kitchen has been updated with newer, traditional materials including raised-panel cabinetry, granite counters and stainless steel appliances. 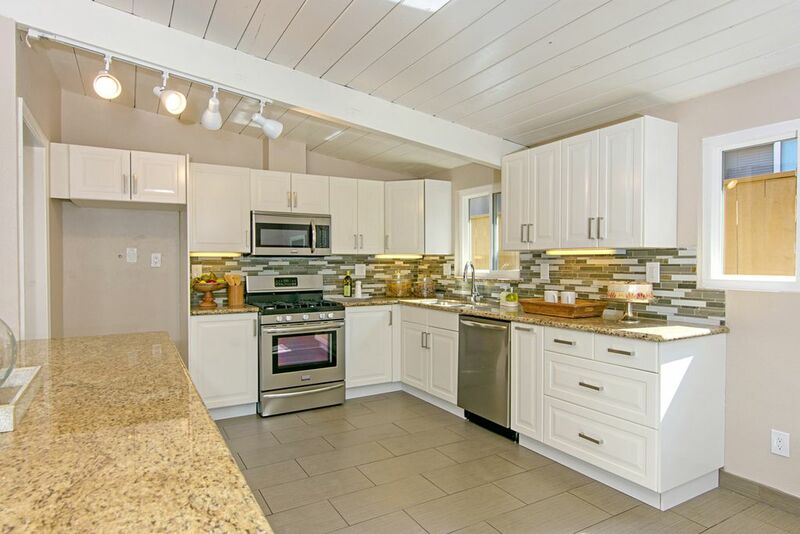 There’s also the obligatory elongated mosaic-tile backsplash sited below the cabinetry. 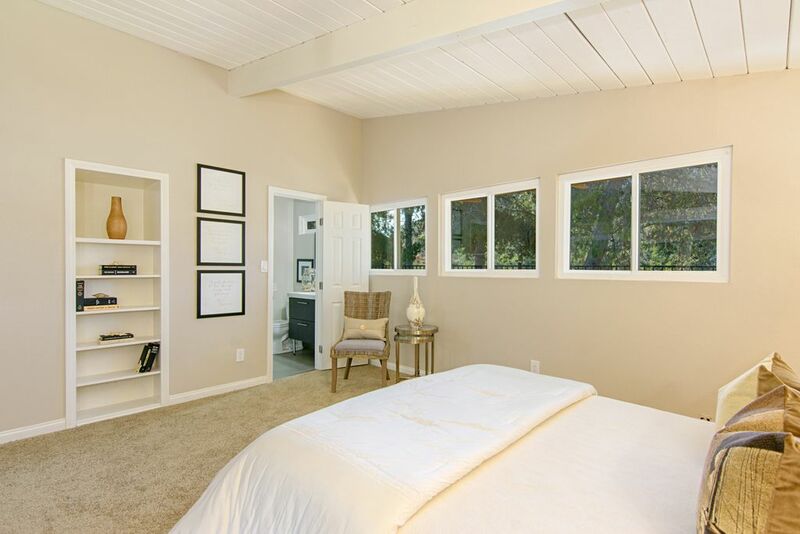 All four bedrooms sit along the north side of the home, with the master bedroom at the rear of the property. 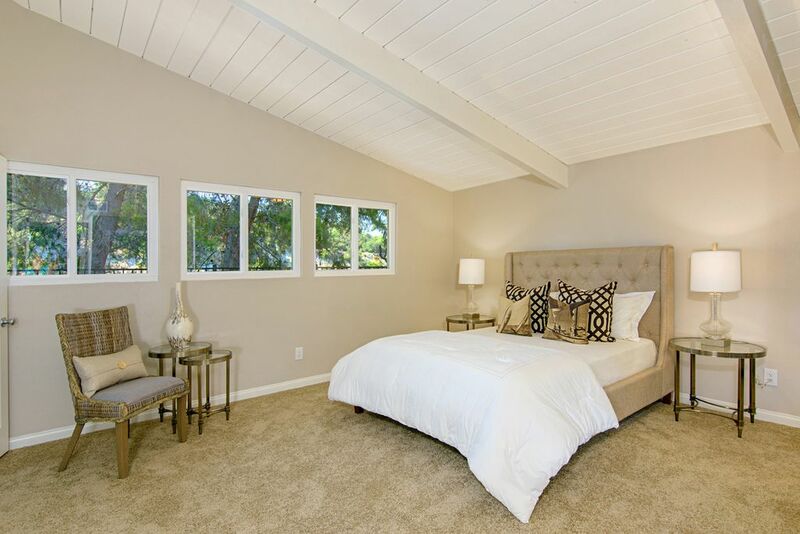 The bedrooms all feature carpeted flooring and maintain consistency with the style of the home. 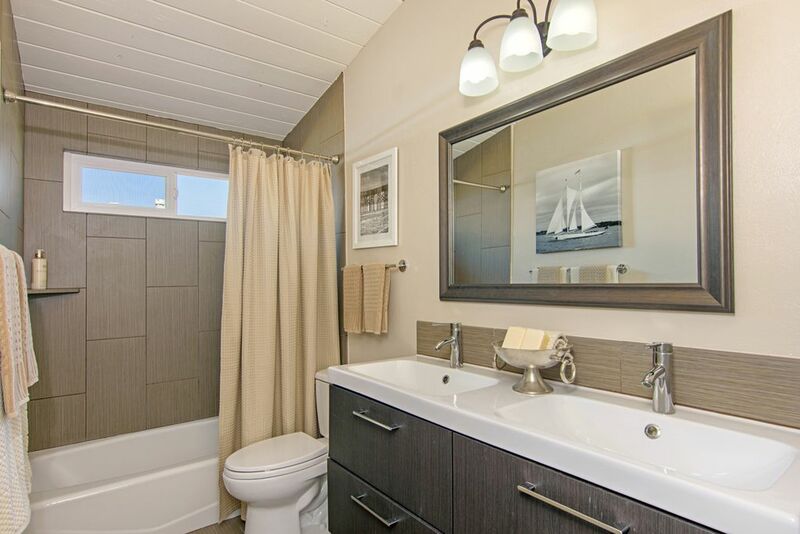 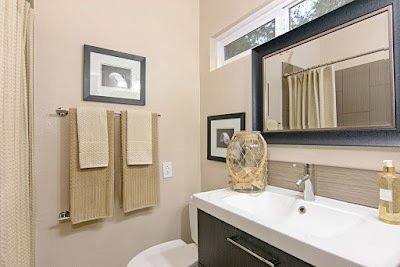 Both bathrooms have been updated with simple, newer materials, including Ikea vanities and floor tiles used on the tub and tile surrounds. 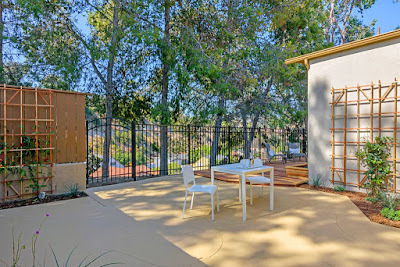 The backyard consists mainly of a deck and patio area, overlooking the adjacent canyon area through a black wrought iron fence. 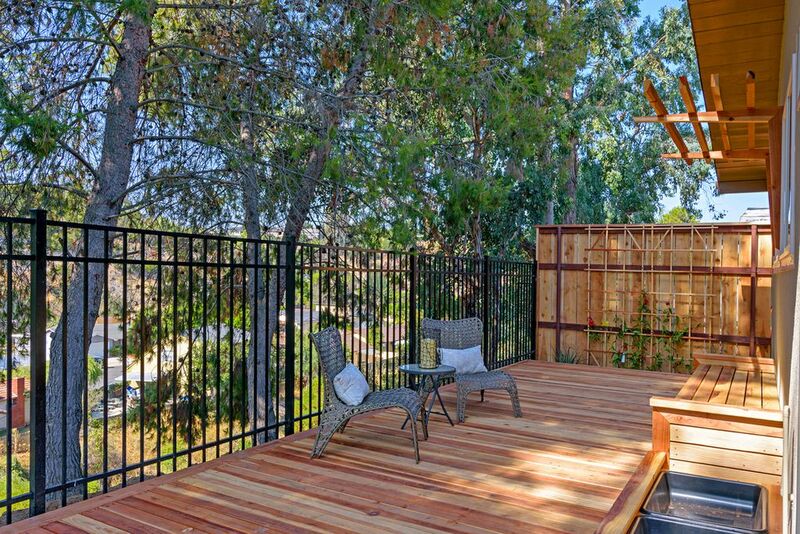 Large pine trees sit along the downward slope of the yard, shading the south-facing yard from the sun. Much of the 9,100 square-foot lot is downward sloped and filled with native vegetation, allowing for privacy between neighbors. While there’s not midcentury left in this home, it’s clean and move-in ready, and features newer fixtures which are relevant – for now.